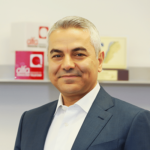 Marwan Hayek is a telecom veteran and award-winning executive who strongly believes in the human side of telco and the power of mobile technology in contributing to the happiness of people. Throughout his international career spanning over 23 years, Mr. Hayek has enabled mobile services to more than 120 million users. Under his leadership, Alfa grew by 3 folds to serve 2.1 million subscribers and has set itself as the leading digital telco provider being the 1st to launch 3G, 4G, 4G LTE-A, and test 5G in Lebanon. Mr. Hayek received 6 awards in recognition of his contributions to the industry.